Snow Ordinary Ghost is licensed under a Creative Commons Attribution 3.0 Unported License. Permissions beyond the scope of this license may be available. Posted to Flickr on 14 September 2009. 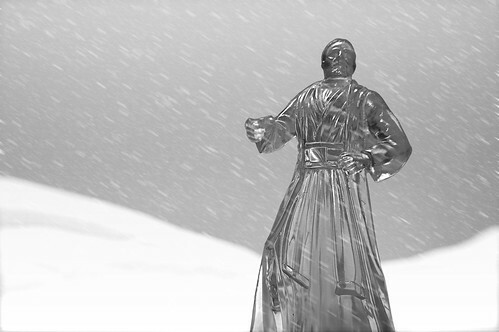 Neither rain nor snow nor death by lightsaber shall keep the transparent Obi-Wan Kenobi from lecturing young Luke Skywalker. Photo submitted to the Flickr group Macro Mondays for the "transparency" theme. This photo was posted to Flickr on 14 September 2009. It was one of 500 images featured on Flickr Explore for that day. The last time I checked, it had 9,045 views on Flickr. Snow Ordinary Ghost by JD Hancock is licensed under a Creative Commons Attribution 3.0 Unported License. Permissions beyond the scope of this license may be available.